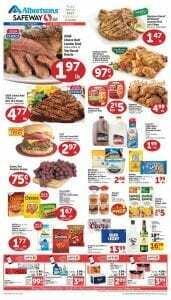 Here is the fresh, fast, friendly and clean store deals of Albertsons for you via Albertsons Weekly Ad Deals Jan 16 - 22, 2019. Check out fresh meal offers such as top round roasts, New York steaks, whole chickens, pork loin chops and more. These are freshly baked every day. You can follow digital offers from page 2. Ritz crackers, large eggs, chuck cheese are the popular products to save on. Page 3 comes with stock up savings event 25% OFF regular retail. Even more great savings are waiting for you on groceries and snacks. Fresh cut meat, chicken, pork and seafood offers are waiting for you on page 5. Tasty fresh fruits and flowers for your home are on this page too. Signature brand by Albertsons is on page 6 this week. There are high quality and trustable products especially for health and beauty. There is 20% OFF regular retail on baby items like wipes, diapers, shampoo etc. Household essentials can be found for very low prices so don't forget to check. On last page of this ad healthy savings are available. 25% OFF on vitamins, prescript drugs, protein bars, wheys and more. Also sweet treats are here for those who like to take short sweat breaks during the day or in front of Netflix at nights.